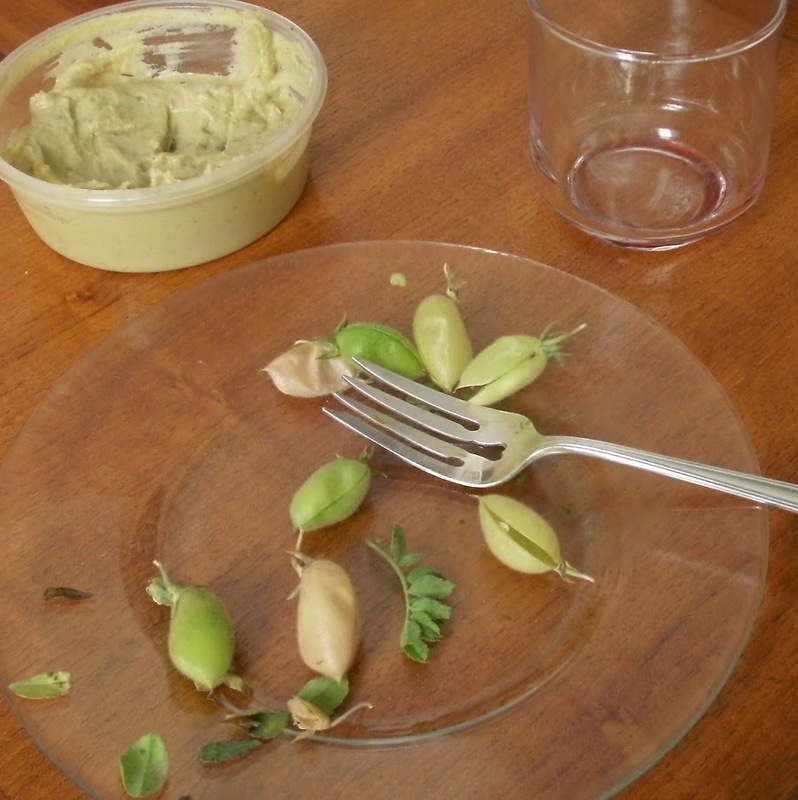 On a plate: sliced apple, half an avocado, smoked Jersey jack cheese, garbanzo beans in the pod. 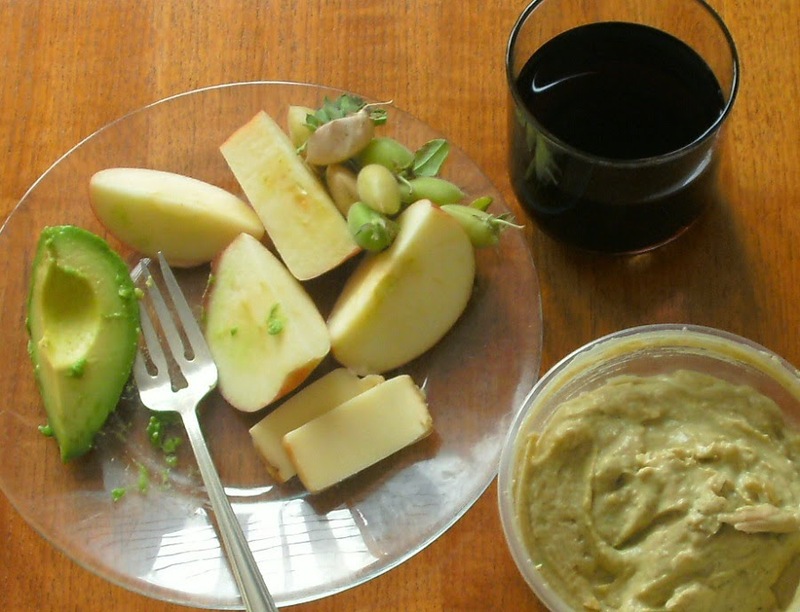 To the side of the plate: a small tub of wasabi ginger hummus and a glass of red wine. The back door is open, there is no screen, there are no bugs. Well, maybe a few. I see a dark spider across the room making its lazy way down a white wall. I sit on a sofa with legs up, stretched out, looking out the back door. This is my sister’s house. Gentle breezes come in open windows. It is warm and dry, the same temperature inside as out. From outside come soft voices of children, perhaps playing next door or two doors down, and this makes the little white poodle curled up at the opposite end of the sofa bark in soft, questioning bubbles. She soon gives it up, puts her head down, sleeps. A fruit fly hovers. I make a slight motion with my hand. It disappears. On the sofa by my side are two used, hardcover books. Each cost two dollars at a store down the street and over a block or two. 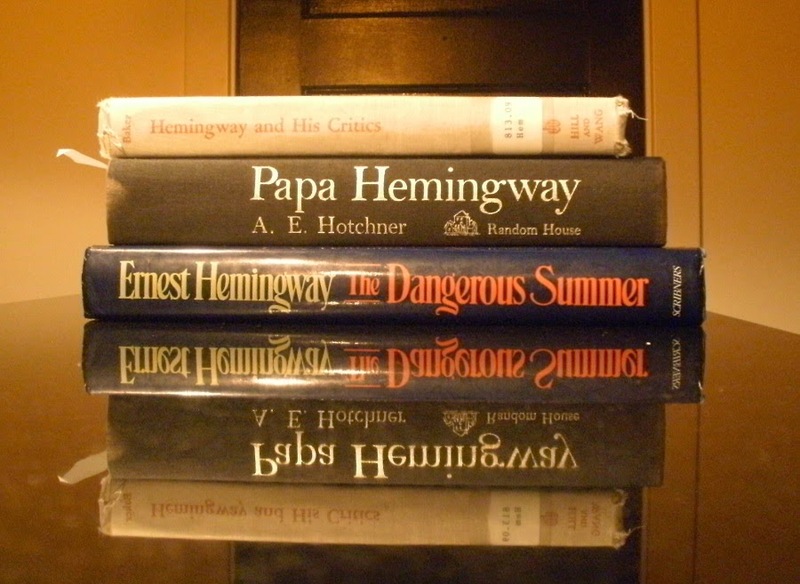 One is “The Dangerous Summer” by Ernest Hemingway and the other is “Papa Hemingway” by A. E. Hotchner. A couple of days ago I bought other books, including a collection of Hemingway critiques published in 1961. What is the coincidence of when a writer enters your life? There is one garbanzo bean per pod. I enjoy popping a pod, eating a bean. It wasn’t long ago I was thinking about garbanzo beans and wondering about their situation. I mean: How are they grown? Where do they grow? Can you eat them raw? I bought a dollar’s worth of beans at the farmers market from the guy who grows the beans and makes the hummus. Buster loved garbanzo beans. I am minding two small white poodles for the week along with a cat. The poodles and I are tired from our afternoon walk. 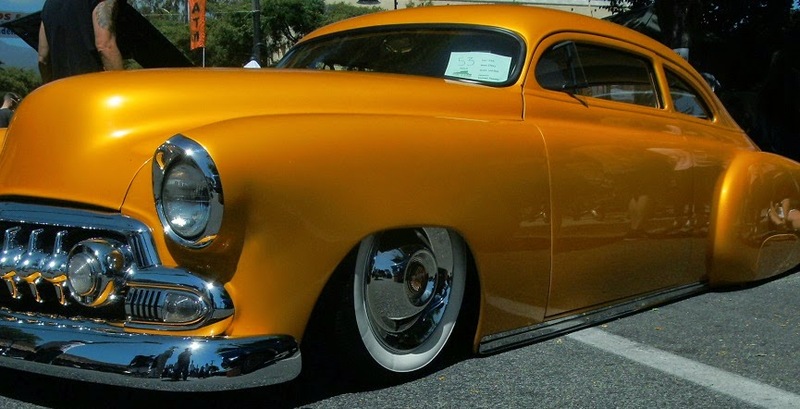 Plus, earlier I walked through a vintage car show that is also down the block, over about three, maybe four. Some cars were painted bright, Popsicle colors. Vintage music played over some loudspeakers. No one danced. One of the cars reminded me of Josie. 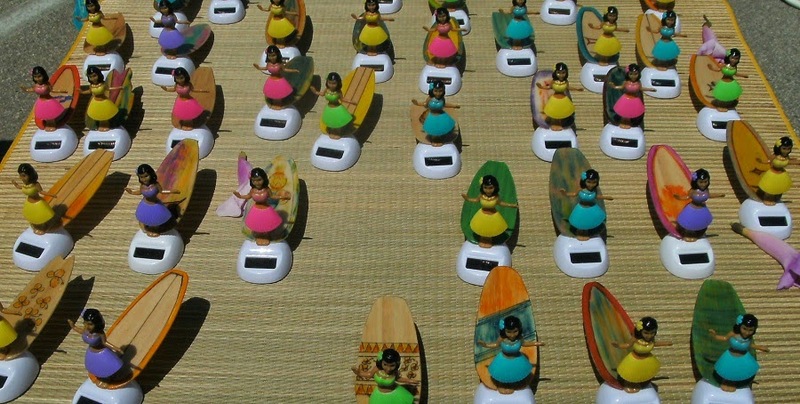 Off to the side in a concrete lot was a small craft fair where I found solar-powered hula girls, and there was a flea market a block or two over. 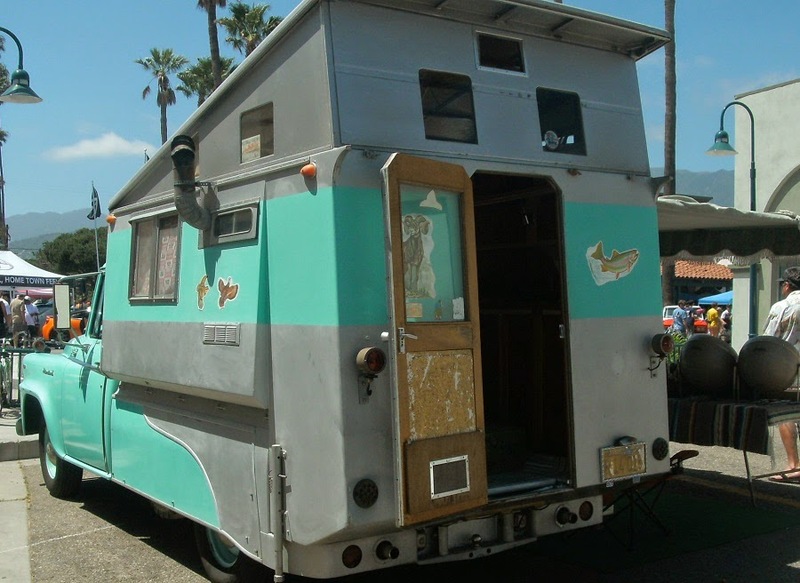 Also off to the side were a funky motor home and a vintage Airstream Bubble, I think it was called a Bubble, maybe from 1953. Both were for sale. I was particularly interested and tried to imagine Josie, Elliott, and myself in either. If we take off, will it be in a motor home? I wonder: Will we take off? Mom: You brought your computer. What are you working on? I want to write down our conversations verbatim, but I do not have my recorder with me. Me: Your bruise is looking better. Mom: Oh, I’m glad. How did I get that? Talking to her is an exercise in repetition. Many of our conversations over the past few years have gone something like this. Mom: Michigan. Is that where you live? Mom: Do you like it there? Mom: What do you like about it? Me: It’s quiet. Not too many people. Lots of woods, deer, that sort of thing. Mom: And you like that? Mom: Do you have neighbors? Mom: Are they good neighbors? Mom: Do you know people? Mom: Do you have friends? Mom: Are you ever lonely? Mom: But you like it there. Me: Yes, most of the time. Mom: You live in Michigan? Today the old saw about truth being stranger than fiction came up, and my mother was asked if she believed it, believed truth to be stranger than fiction. She could not say, she said, for she did not know which was which.